After launching seven Ryzen processors based on the new Zen microarchitecture, AMD has turned its focus to the data center by releasing the Epyc 7000-series chips. This Zen-based CPU strategy is being further augmented by the announcement of Ryzen Pro, ostensibly AMD's answer to Intel's business-optimised vPro strategy. Though formally to be rolled out on August 29, AMD shared some high-level details on Ryzen Pro at a press briefing last week. Looking to appeal to 'professional' customers and take a chunk of Intel's current business, AMD needs to address the tenets of security, long-term availability and image stability. Let's take a look at the Ryzen Pro models first, then focus on how AMD is proposing to meet the other challenges after. AMD is to split its Pro offerings into the expected Ryzen 7, Ryzen 5 and Ryzen 3 families. 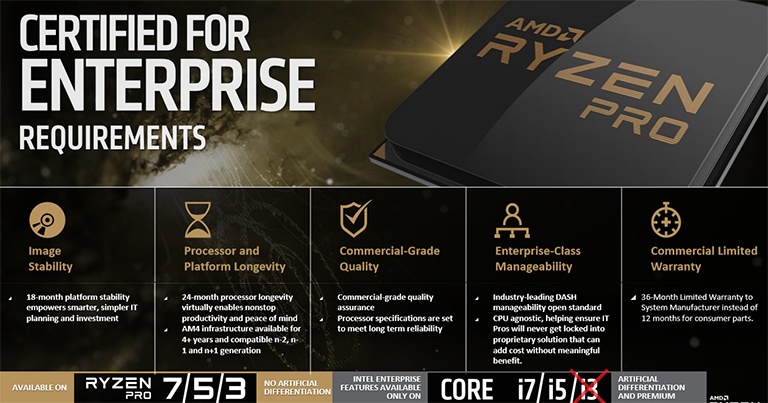 The most interesting part is the Ryzen 3, because AMD has yet to detail the consumer parts' specifications yet. Ryzen 7 Pro 1700 mirrors its consumer cousin's base and boost speeds while the Pro 1700X is clocked in 100MHz higher on both fronts. Though a 95W TDP is supported for Ryzen Pro, AMD's John Hampton explained that a 'Pro 1800X', which would otherwise fit into the thermal envelope, won't be made available because the cooling capabilities of business platforms aren't as robust as that for the enthusiast desktop. Whatever the case, the Pro 1700X is close enough in raw specification to render the point moot. Ryzen 5 Pro 1600 is a direct specification copy of the CPU we have already reviewed, and the Ryzen 5 Pro 1500 is effectively the desktop 1500X by another name. Ryzen 3, meanwhile, is confirmed as a four-core, four-thread CPU - SMT turned off, supposedly - and it's designed to meet a lower price point. AMD makes no bones about direct model-to-model comparisons to Intel Core i7, Core i5 and Core i3 chips, however, and to that end trotted out various performance metrics that, on the whole, put it comfortably ahead in terms of speed. Rolling out the now-familiar spider chart and showing relative performance across nine applications that it believes exemplifies the kinds of workloads used by business customers, AMD cranks up the 'more cores, more threads, more performance' message that has been in evidence since Ryzen's inception, comparing its performance against model- and price-relevant Intel chips. According to AMD, Ryzen Pro wipes the proverbial floor with Intel, and if our consumer benchmarks are anything to go by, AMD wins handsomely in multithreaded scenarios but loses out in single-threaded apps. Of course, Intel could pick different benchmarks, but performance shouldn't be a limiting factor for AMD. Interestingly, though included, AMD really doesn't like the Intel optimisations in the one benchmark it sometimes loses in, Sysmark 2014, and has a long history of debating the point. OK, so performance is predictably impressive, so what special sauce exists to make Ryzen Pro materially different to regular Ryzen. In other words, why shouldn't business owners just plonk a regular chip into their machines instead? Well, a few extra features and benefits are required. Businesses don't like unnecessary change, especially with respect to their IT ecosystem, so it's inevitable that Ryzen Pro features software image stability for at least 18 months, meaning that drivers will remain the same even if the underlying hardware changes. This feature goes hand in hand with platform longevity, as well. Commercial-grade quality is an interesting one. Appreciating that these CPUs are likely to go into PCs that have less airflow and are more space constrained than, say, an enthusiast tower, AMD says that chips are selected 'from wafers with the highest yields ensures fewer defective parts and commercial-grade quality for AMD Pro products.' This translates to a three-tiered strategy where the very best silicon is reserved for Epyc server processors, then for Pro chips, and what's left is divided amongst desktop Ryzen parts. This is why AMD also outfits them with a standard 36-month warranty. Baked-in security is paramount for business, and this is why AMD is including what appears to be the same secure memory encryption as that found on Epyc. In short, AMD is able to AES-encrypt system memory by using an in-line hardware processor, with the associated key stored on an on-chip secure processor. The performance hit is minimal, the company says - a few cycles of additional latency - but the feature is not explicitly supported on regular Ryzen. Notice the red crosses for Intel Core i3 on the two slides above? This is very deliberate and overt, as Intel's generally comparable technology, vPro, is not available on the cheapest Core models. Ryzen Pro's feature set, meanwhile, is consistent across the entire range. That consistency almost means every Ryzen Pro will need to be paired with a a a dedicated graphics card in a system; IGP-infused chips are not yet available. We have yet to hear of bulk pricing, general availability, see partner implementations, and gain visibility on whether AMD will introduce a new class of supporting motherboard for Ryzen Pro, like Intel does. All that detail, and more, will be revealed at the full launch on August 29. For now, AMD moving its Ryzen CPUs into the business market makes implicit sense. I am really interested in these, I wonder how many vendors take them on as part of their enterprise line up. I would really like Ryzen Pro Laptops as part of the next hardware refresh! So now we know the clockspeeds of the Ryzen 3 CPUs. These probably have longer warranties?? They will be mostly for system integrators I suspect. doesn't look like it… retail has 36months and that graph shows 36months oem limited warranty. 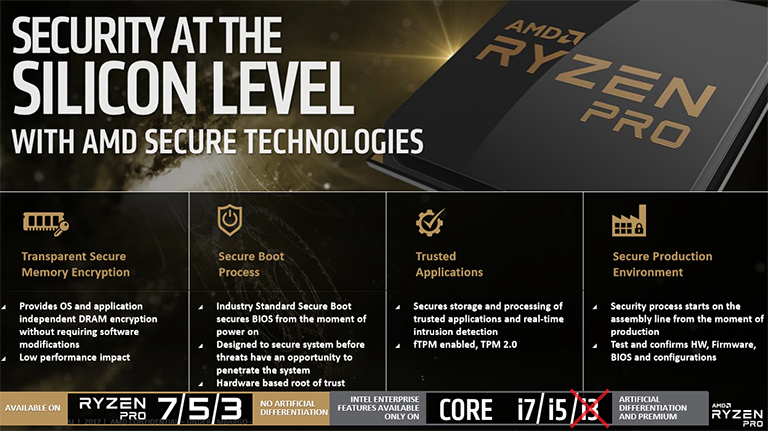 It just seems a few additional security features (seems pretty close to intel tpm) and ‘driver stability’ from what I can see which imo wouldn't actually go a miss on consumer either.